Corporate philanthropy has come a long way since the early 1900’s when U.S. courts upheld rulings against corporations giving money away. Today, corporate philanthropy is not just only accepted but expected. And, while the most common form is direct funding of charities, the landscape includes a wide variety of types of ‘giving’ including cash donations, as well as other resources such as product donations, expertise and employee volunteering. As businesses take on greater responsibility in finding solutions to our societal challenges, corporate philanthropy continues to transform and evolve. The diagram below frames the dialogue about emerging trends among thought leaders in the field. 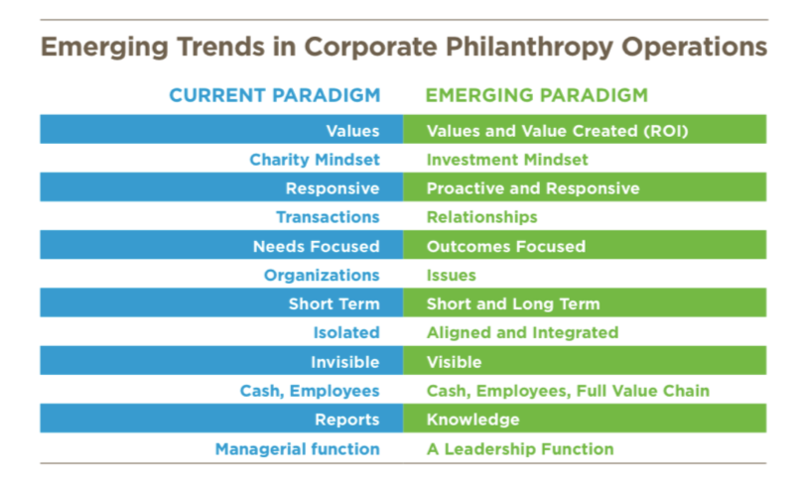 It is not surprising that while research has found common elements among successful corporate philanthropy strategies, it also has revealed that the best approaches are unique in their fit to the respective companies and communities. Finding the right strategy to amplify a community benefit program requires a thoughtful examination of the corporation’s vision and its goals for philanthropy. Nonprofit Strategies can help focus your company’s philanthropic activities to reflect your goals and generate a greater impact in the community.